What do people mean when they say play modally? Following on from my last blog about Guthrie Govan scales, I’d like to clear a few things up about what it means to ‘play modally’. I see a lot of communication breakdown over this so I thought I’d share some light on what playing modally is but also what guitar players might think it is! 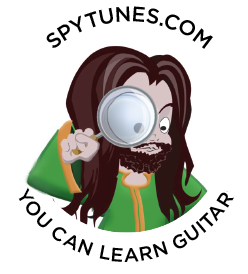 This is an advanced lesson so do ensure you read the Guitar Conspiracy and completed the beginner and intermediate courses. The important part of this lesson focus on a chord progression using an x chord. But before we go there, let’s first examine a few misconceptions. So what does it mean, how do guitar players refer to it and more importantly, how do you play modally? Since a mode is “a part of a scale” you can easily play modally over a diatonic progression like I – VI – II – V.
When you play over chord I, you think of all notes as intervals in relation to I, let’s say we are in the key of E.
E – F#m – G#m – A – B – C#m – D#m7b5. So over chord I, you play the note C#, you are playing a 6th interval, it will sound like a 6th over chord I. Next, the VI chord, let’s say you play the note F# now. If you are thinking modally, this is now the 4th interval in relation to the C# root. Not the 2nd interval in relation to E.
Over the II chord, let’s say you play an A, this is now the m3rd in relation to the F# root. Over chord V, let’s play a B, this is now the root. Should you not think modally, but as if everything is from the major scale then the notes you played would have been C# (6th) F# (2nd) A (4th) B (5th). With all this in mind, it would be fair to say that you are always playing modally since intervals are heard in relation to the chord. No matter if you are aware of this or not. But hang on, this is not how most guitar tutors describe playing modally! They either use a drone as they loop over two chords like F#m7 – G#m7/F# or they play two chords in a bar: F#m7 – B7 and blanket solo with a mode, in both these cases F# Dorian. So the question isn’t really what does it mean to play modally… The question is, what do you mean when you say play modally? And more importantly, can you do it? Let’s take another example, ‘All I Wanna Do’ by Sheryl Crow. This is a great example of a song that works best if you use the modes. First of all, the song has a modal interchange, it manipulates a chord, tricking us to think we are on a different degree of the scale. VIx – IV – V or E – C – D.
If you try modes over the three chords, you will soon find how Mixolydian works well over the V chord and Lydian over chord IV. Over the modified E chord (VIx) the Mixolydian b6 scale works best. As the bridge section enters, we move between Bb and A, on a loop. Two major chord a semitone apart is to the modal scale expert an indication that we are dealing with Lydian and Phrygian Dominant. Sure, it would have made more theoretical sense if these two chords were A – G#, rather than a semitone up as Bb – A, as we’re kind of in the key of E. However, it still is a fact that two major chords a semi apart does spell Phrygian Dominant. Using the chordacus images below, can you see how there is an E shaped A chord and an E shaped Bb chord inside the A Phrygian Dominant scale? Should you solo over this section you want to use this scale over the A chord, for the Bb, play Bb Lydian. This will mean that the note C# is swapped for a C whenever the chord is Bb. Should you do all this, including the Mixolydian b6 scale over the verse E chord you would, in fact, be playing modally.